Run unit tests for PL/SQL code to determine their functional accuracy. This article has the following sections. Toad DevOps Toolkit must be installed and an instance of the toolkit started. PowerShell 3.0 or later must also be installed. The example scripts are based on PowerShell 5.0 and PowerShell 3.0 may be used. Two Oracle Database instances must be running. PowerShell 3.0 or later must be run with Windows administrator privileges. Right-click on Windows PowerShell and click on Run as administrator as shown in Figure 1. Administrator shell for Windows PowerShell gets started, as shown in Figure 2. Change directory (cd) to the Toad DevOps Toolkit directory in which the PowerShell examples are installed. 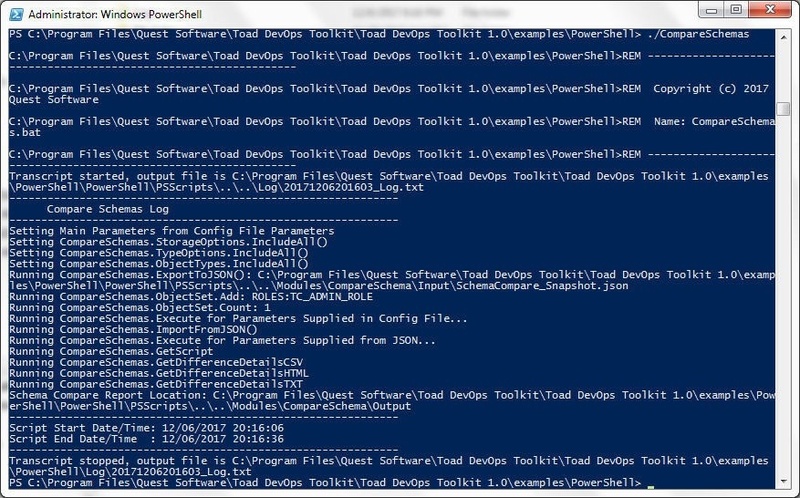 cd "C:\Program Files\Quest Software\Toad DevOps Toolkit\Toad DevOps Toolkit 1.0\examples\PowerShell"
The current directory gets set to the PowerShell examples directory, as shown in Figure 3. As mentioned before, two Oracle Database instances are required, a Source and a Target database. 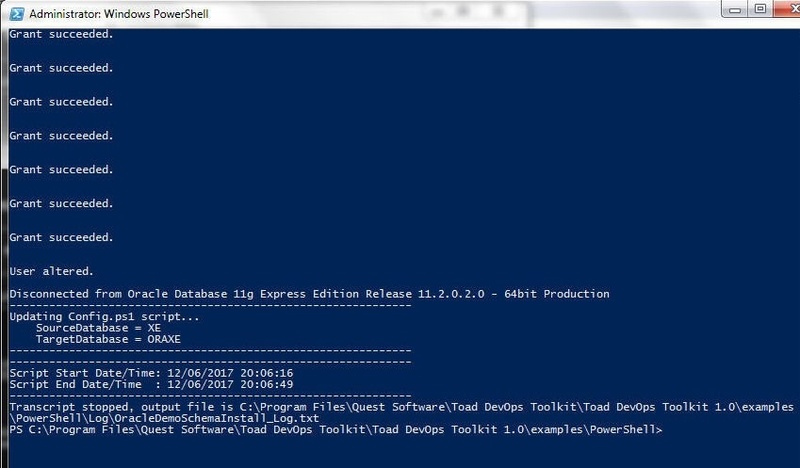 The Install batch script included with the PowerShell examples installs the DEMO schema on both the Source and the Target databases. The user for both Source and Target databases must have SYSDBA privileges. 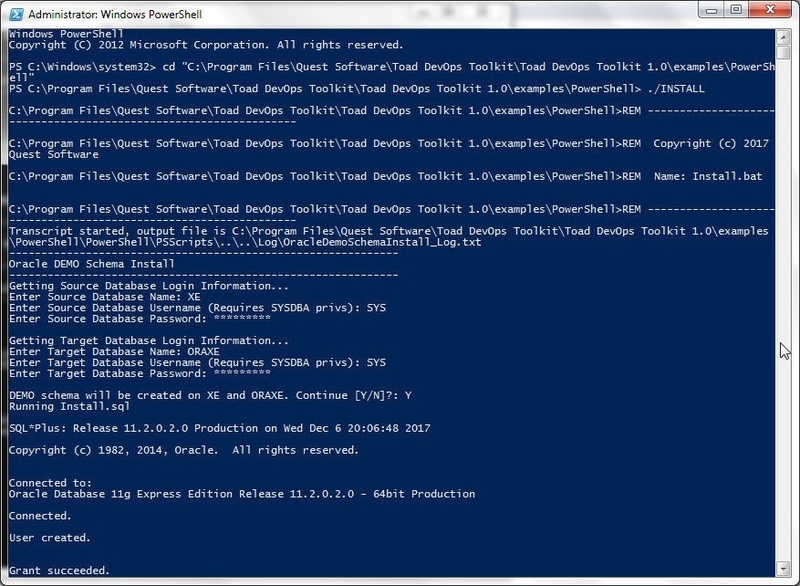 Run the ./INSTALL command from the PowerShell examples directory. Oracle DEMO Schema Install gets started, as shown in Figure 4. First, the login information for the Source Database must be provided. The first prompt is Enter Source Database Name: as shown in Figure 4. Specify the Source Database Name as XE as shown in Figure 5. Specify Source Database User Name as SYS, which has SYSDBA privileges. Specify the Password for the SYS user. Click on Enter after adding each value. After the Source Login information has been provided the Target Database Login information must be provided, as shown by the prompt Enter Target Database Name in Figure 5. Specify the Target Database Name as ORAXE as shown in Figure 6. Specify the Target Database User Name as SYS, which has SYSDBA privileges. Specify the Password for the SYSDBA user. Click on Enter after adding each value. The prompt DEMO schema will be created on XE and ORAXE. Continue (Y/N)? : appears. Specify Y as shown in Figure 6 and select Enter. Figure 6. DOM schema will be created on XE and ORAXE. Continue (Y/N)? 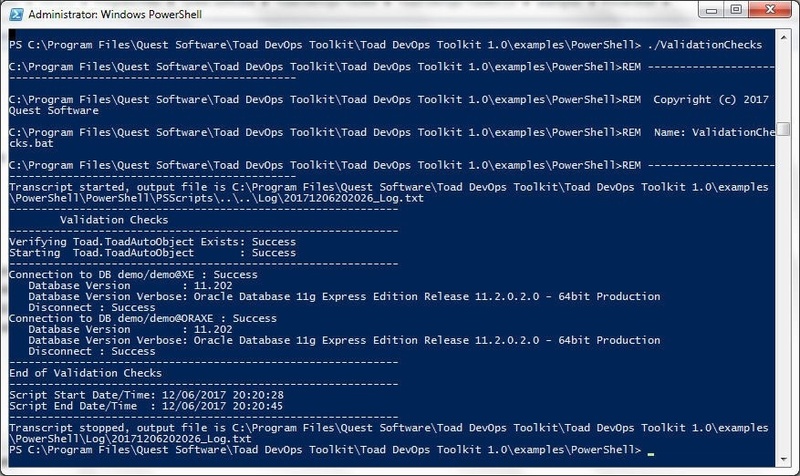 The install.sql script in the C:\Program Files\Quest Software\Toad DevOps Toolkit\Toad DevOps Toolkit 1.0\examples\PowerShell\PowerShell\PSScripts directory starts running, as shown in the output in Figure 7. First, $TDT connects with the Source Oracle Database Instance and the DEMO user gets created. After creating the DEMO schema on the source database the $TDT instance disconnects from the source database. Subsequently the Target Oracle Database gets connected to, and the DEMO schema gets created on the target database also. After creating the DEMO schema on both the Source and Target databases the $TDT instance disconnects from the databases and updates the configuration file Config.ps1, also in the C:\Program Files\Quest Software\Toad DevOps Toolkit\Toad DevOps Toolkit 1.0\examples\PowerShell\PowerShell\PSScripts directory, with information about the installing the DEMO schema including the Source and Target databases, as shown in Figure 8. The script start and end timestamp gets output. 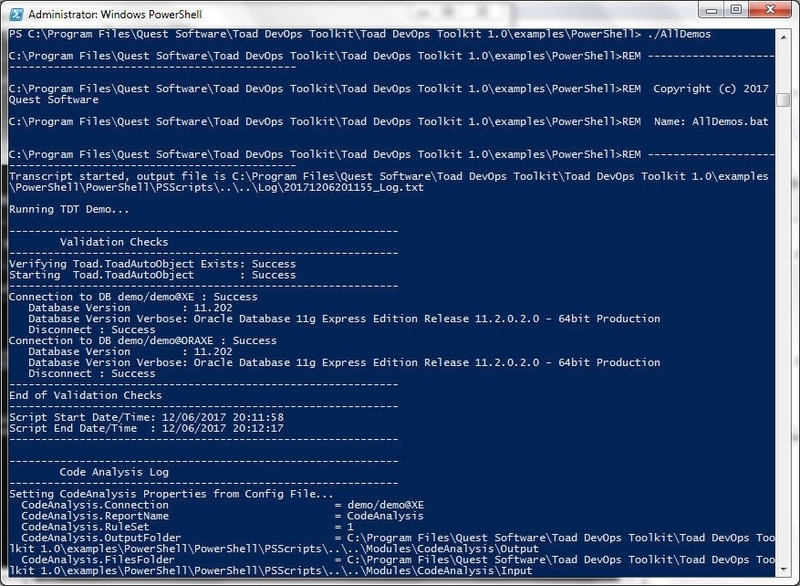 A more detailed output from running the ./INSTALL PowerShell script is as follows. Copyright (c) 1982, 2014, Oracle. All rights reserved. A log file C:\Program Files\Quest Software\Toad DevOps Toolkit\Toad DevOps Toolkit 1.0\examples\PowerShell\Log\OracleDemoSchemaInstall_Log.txt gets created. If the INSTALL PowerShell script runs partially, creating the DEMO schemas on Source and Target databases but generating some error before completing, the DEMO schema must be dropped in the Source and Target databases before running the INSTALL script again. The DROP USER statement used to drop the DEMO schema is run in SQL*Plus and must include CASCADE. The DEMO schema may get created on the Source database only, or on both the Source and Target databases, and the INSTALL script might generate an error subsequently. One of the possible reasons for the INSTALL script generating an error after creating the DEMO schema on the Source database is that a connection does not get established to the Target database. A possible reason for the INSTALLscript generating an error after creating the DEMO schema on both the Source and Target databases is that some required database object is not found. 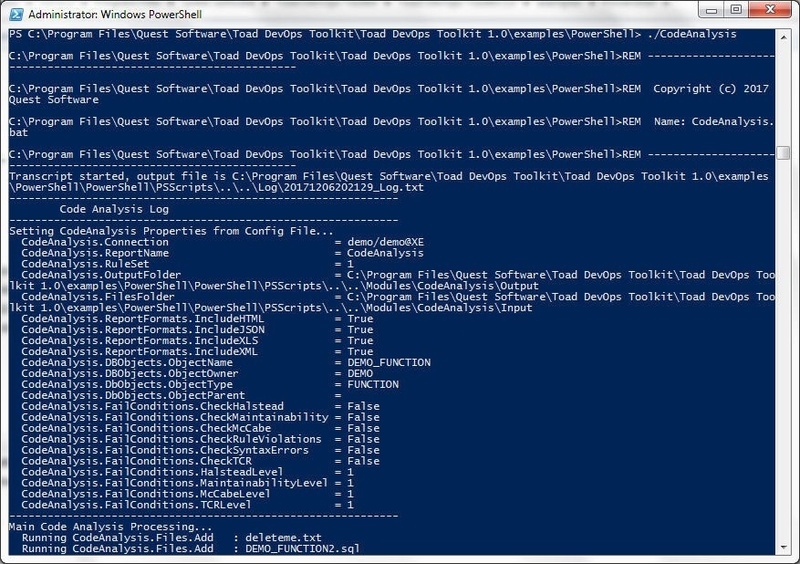 Next, we shall run some of the other PowerShell examples included with Toad DevOps Toolkit. The ValidationChecks example runs tests to determine the connectivity of the Source and Target Databases with an instance of Toad DevOps Toolkit $TDT. Run the example with the following command from the examples directory. The ValidationChecks example validates the following connectivity tests, in which the $TDT object is invoked for each task and test. The Toad.ToadAutoObject exists, which implies that an instance of Toad DevOps Toolkit is available. The Toad.ToadAutoObject instance gets started. The connection to the Source demo database XE gets established. The Source database version gets output. The connection to the Source demo database XE gets disconnected. The connection to the Target demo database ORAXE gets established. The Target database version gets output. The connection to the Target demo database ORAXE gets disconnected. The output from the ValidationChecks example is shown in Figure 9. 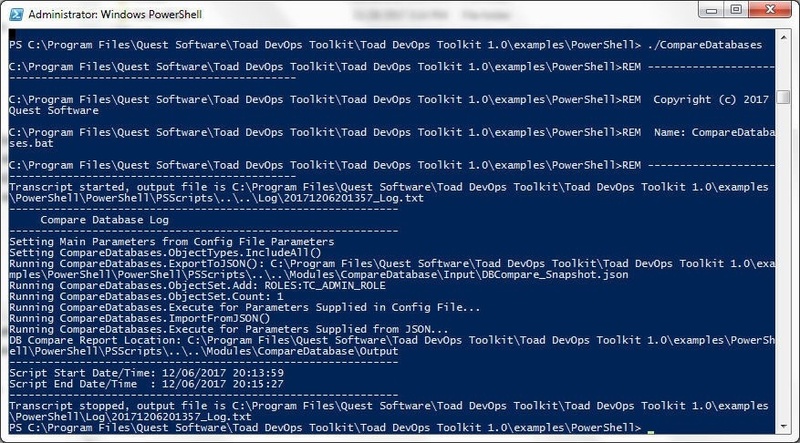 A log file C:\Program Files\Quest Software\Toad DevOps Toolkit\Toad DevOps Toolkit 1.0\examples\PowerShell\Log\20171206202026_Log.txt gets generated. Next, run the CompareDatabases PowerShell script. The CompareDatabases example performs the following tasks or tests with an instance of Toad DevOps Toolkit $TDT being invoked for each task and test. Sets main parameters from Config file parameters. Includes/Excludes objects. Sets object types to include to all types. Runs the parameters supplied from the Config file. Exports properties to JSON Snapshot file DBCompare_Snapshot.json. Imports from JSON Snapshot file. Runs the parameters supplied from the JSON file. Runs an Object set count. Performs a comparison of database objects and outputs a report. The output from the CompareDatabases example is shown in Figure 10. The CompareSchemas example performs the same comparisons as the CompareDatabases example and some additional tasks, which are as follows. An instance of Toad DevOps Toolkit $TDT is invoked for each task and test. Includes/Excludes Storage options and Type options in addition to the Object options. Exports properties to JSON Snapshot file SchemaCompare_Snapshot.json. Gets difference details in CSV, HTML and TXT formats. 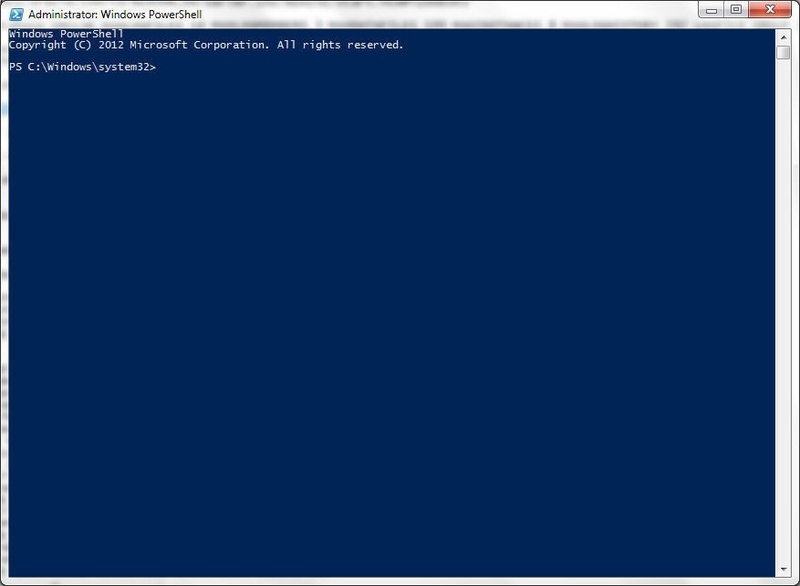 Run the CompareSchemas example with the following command run from the PowerShell examples directory. The output from the CompareSchemas example is shown in Figure 11. The CompareTables example performs the following tasks and tests with an instance of Toad DevOps Toolkit $TDT being invoked for each task and test. Exports properties to JSON Snapshot file TableCompare_Snapshot.json. Run the CompareTables example with the following command run from the PowerShell examples directory. The output from the CompareTables example is shown in Figure 12. The CodeAnalysis example determines the code quality using a RuleSet. A default RuleSet is provided and custom RuleSets may be used. The CodeAnalysis example processes both files and database objects and runs the following tasks. Run the CodeAnalysis example with the following command run from the PowerShell examples directory. The output from the CodeAnalysis example is shown in Figure 13. All PowerShell demos may be run with the single command ./AllDemos. One demo gets run after another, as shown in Figure 14. 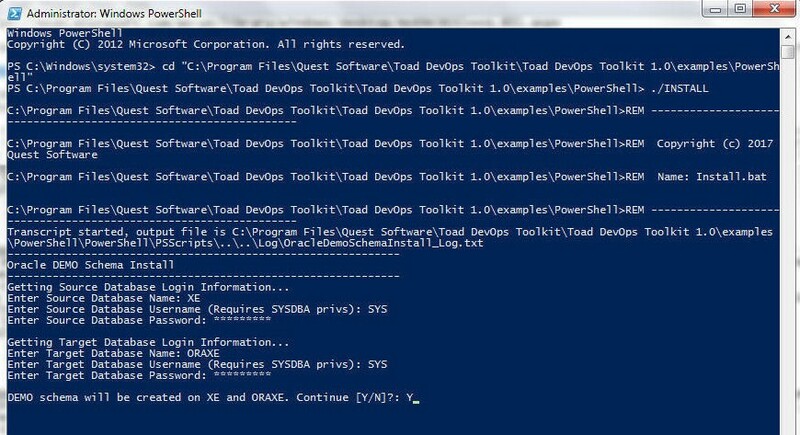 In this article we discussed running some PowerShell demos with Toad DevOps Toolkit. An instance of the toolkit $TDT gets invoked for each test or task. A log file gets generated for each demo. A report gets generated for each of the comparison examples. The example PowerShell scripts may be customized or used as such for code analysis and for generating comparison reports. 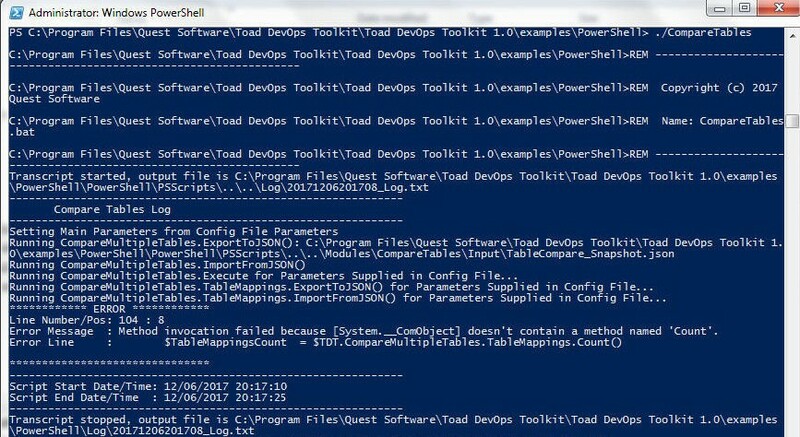 Having used the example PowerShell scripts with Toad DevOps Toolkit and two Oracle Database instances running on a local machine, some of the other capabilities of Toad DevOps Toolkit may be explored. TDT is supported with Oracle Database instances running on two cloud platform services: Oracle Database Cloud service, and Amazon Elastic Compute Cloud (EC2). TDT may be run using a Jenkins pipeline to automate some of the cmdlets/scripts.